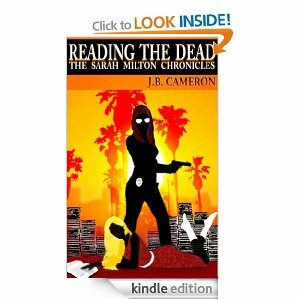 Reading The Dead – The Sarah Milton Chronicles is the first volume of a paranormal detective series by author J.B. Cameron. Sarah Milton, a criminal profiler with the LAPD Violent Crimes Unit, is on the hunt for the city’s most notorious serial killer, an enigmatic figure known only as “Raithe.” Thwarted at every turn by a seemingly random string of murders, the detective finds inspiration from the unlikeliest of sources. After a fatal shooting unexpectedly reunites her with Anna Nigma, her precocious, thirteen year-old “imaginary friend” from childhood, Sarah’s investigation leads to a spectral world governed by ancient magic, and rekindles powers within her to commune with the dead, threatening more than just her livelihood and sanity. Together, the reunited friends take their first step on their paranormal adventures. Their journey starts here: with the ghostly origins behind the latest slayings inflicted upon the city of angels. They must follow the path through the graveyard of Sarah’s past, culminating in a struggle against a dark force with the power over life and death itself. Is the legend they will ultimately write together destined to be their final tale? Combine the supernatural with a police procedural and you get his engaging novel. I loved Sarah Milton and really got on board with this protagonist and the obstacles she faced. Her mother was murdered, the case remains unsolved, her relationship with her father is estranged at best and she can see ghosts. Sarah Milton is part of the Violet Crimes Division, where her otherworldly powers give her clues she otherwise wouldn’t have, and her supernatural side-kick is a useful ally in this first book but we learn nothing about her history in this edition. I assume there’s much more to come in future installments. I particularly enjoyed the reading about Meghan, Sarah’s best friend, and her antique books. A thriller with a supernatural element which fits. Cameron writes with wit and humour and invites us into the head of his troubled protagonist. I loved this and I look forward to learning more about Sarah, her mother’s homicide and Anna in the next one.